Wetzlar, 31st January 2019. Inspired by adventure and the great outdoors, Leica Camera AG is releasing the latest model of the olive green ‘Safari’ series: the limited-edition Leica M10-P ‘Safari’. The Leica M10-P Edition ‘Safari’ will be restricted to 1,500 units and promises to be a sought-after collector’s item. The olive green ‘Safari’ editions have a long tradition at Leica, dating back to the early years of the M-System. Originally designed and constructed for the armed forces in the 1960s, their reputation as rugged and reliable tools spread rapidly around the world, making them highly sought after amongst collectors. While these early olive green products were made exclusively for military use, demand saw the first Leica R3 ‘Safari’ camera introduced to the public in 1977. 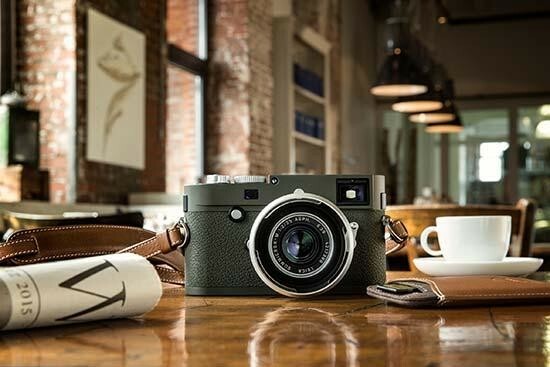 The latest Leica M10-P ‘Safari’ Edition’s olive body and silver controls contrast in an elegant and timeless manner, suiting the camera’s compact and versatile design perfectly. The luxurious yet practical ethos continues with the accessories, which include a carrying strap and case for SD memory cards and credit cards crafted from brandy-coloured, full-grain cowhide. The body is on sale from today and will be followed by a matching lens on 15th February. Sold separately, the Leica Summicron-M 50mm f/2 Edition ‘Safari’ premium lens is the very first M-lens in the company’s history to be produced in this signature olive finish, the pairing of the body and lens being a proud moment for Leica’s tastemakers as well as a truly desirable symbiosis of functionality and design. Compatible with all M-Cameras, this fast lens aesthetically complements all other ‘Safari’ Edition cameras. In addition to its special enamel finish, the ‘Safari’ lens boasts other unique design features. The focal length engravings are picked out in red paint which stands out against the otherwise white engravings on the lens. Currently, Leica will produce just 500 examples of the Leica Summicron-M 50mm f/2 Edition ‘Safari’ lens. All visible metal components on both the Safari body and lens are elaborately machined from solid brass. The camera’s premium stove enamel finish makes it resistant to finger marks and scratches and provides enduring protection against external influences.